Chelsea ace Ruben Loftus-Cheek has revealed that Kepa Arrizabalaga apologised to all the players after the League Cup final controversy last month. 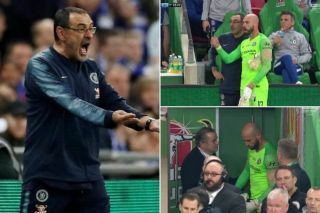 As has been well documented, the Spanish goalkeeper seemingly refused to come off at the end of extra-time at Wembley in the clash with Manchester City for the Carabao Cup, with Maurizio Sarri left infuriated on the sidelines as he tried to bring on Willy Caballero for the penalty shoot-out. It has since been put down to a misunderstanding and miscommunication between the two, while Kepa was fined and dropped for the win over Tottenham last week. However, Loftus-Cheek has provided more of an insight from the player’s perspective, as he revealed that his teammate apologised to the entire group for the misunderstanding and that the Chelsea squad accepted that apology, as seen in the video below. The 24-year-old returned to the starting line-up in the win over Fulham on Sunday, and so coupled with the fact that the players accepted his apology and Sarri has made his point, it appears as though Chelsea are moving on from it and focusing on the important objectives they have this season. "He was honest. He apologised to all of us"